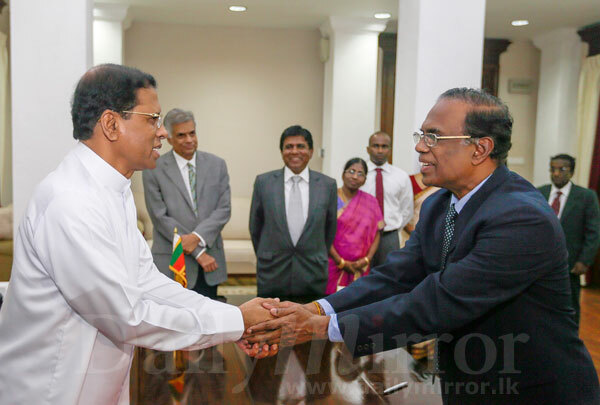 The senior most Supreme Court Judge K. Sripavan was a sworn in by President Maithripala Sirisena as the new Chief Justice of Sri Lanka. Felt sorry for your ignorance!!! Congratulations. Welcome the appointment made on seniority. The real democracy at work. Best wishes to new CJ Mr. Sripavan. Also best wishes and good luck to former CJ Dr. Shirani Bandaranayke. How moving! 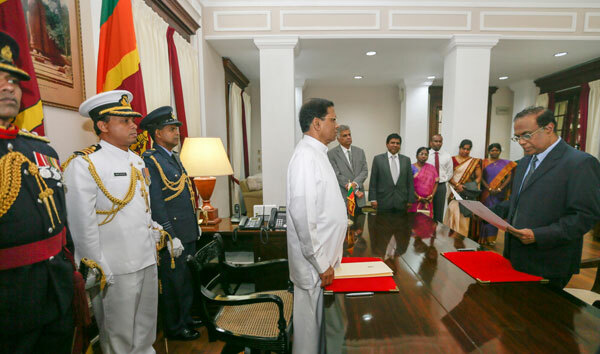 Mr. Maithripala Sirisena was sworn in by Justice Sripavan. 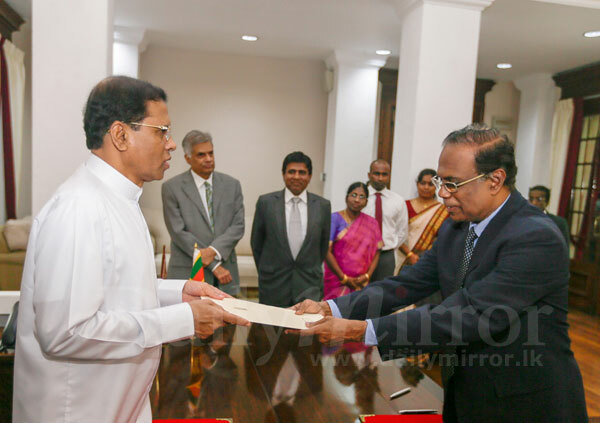 Now President Maithripala Sirisena has sworn in Justice Sripavan as the Chief Justice. Long live the rule of law in Sri Lanka. Correct job.law must be a law.No majority or minority.who is suitable . congratulations . Mr President . Good choice. HONORABLE SIR, MAY GOD BLESS YOU AND GIVE YOU STRENGTH TO CARRY OUT YOUR DUTIES. A man completely deserved this honour - Hats off to the current regime..! Yes its nice to see a person of integrity finally becoming CJ. I hope he will be independent and will not have to be "grateful" to appointees. This also marks a milestone in reconciliation. It is great that a Tamil Person comes to the 3rd highest position in the country, head of the one branch of the government. He really deserves to be the CJ. Congratulations !!!! Jaffna Hindu College has produced several intellectuals over the last hundred years or so. He is one of them and to his service has been timely recognized by the present regime without any political agenda in mind. Congratulations Sir. Truly humbled two men. Hopefully we will be able to restore the dignity of all the peoples of Sri Lanka be it Tamil, Muslim or Sinhalese.Well done. Hon Presidents choice is the best of best. He is not racial. The General Public really like this selection as Mr. Sripavan is a loyal servant of SriLanka. Congratulations Sir!. We should appreciate any genuine person with lot of talents and not to ignore them for their ethnic background. This is the way to build a nation in a right way! Wonder what Wimale will say to this, another "Conspiracy"
I being a Muslim like to see a Tamil is CJ as they will be very honest in this position unlike our Muslim lawyers. Proud to be a Sri Lankan. I hope we can move away from Tribalism once and for all. Congratulations your Honor. May you dispense justice as it was meant to be. SJ Shirani Bandaranayake was given permission to occupy office just for one day by Sirisena Administration for compromising Judicial Integrity with Rajapakse administration during her hay days Rajapakse. It is very unfortunate she had to pay a heavy penalty of 08 long years of unspent service as the CJ.The people believe this would serve as a good lesson for all judges in the Superior Court System. Congratulations to Chief Justice Mr Sripavan. You deserve this appointment based on merit and seniority. President Sirisena, excellent appointment and this proves that you are such an open minded person who is an avtar who is going get Sri Lanka out of cheap and petty divisive politics. My best wishes to you and the PM Ranil for having raised the hopes of all Sri Lankans ..well done so far and please continue this beautiful path. I love Sri Lankla and I am a Tamil. These pictures worth thousand words. Genuine look in their eyes and handshake. I am proud to see such honest and open minded people coming together in building better Sri Lanka. I am proud to be a Sri Lankan again. I wish to congratulate you at this our of good governance as my contemporaneous at Jaffna Hindu college although not in the same class but different division. At long last a man of integrity as Chief Justice. Congratulations to Proud Old Student of Jaffna Hindu College K.Sripavan! Dawn of a New Era in Srilanka! Congratulations ...!!! Happy to see good things happen after long time... God bless Sri Lanka and make all happy And prosperous. CONGRATS!!!!!! THIS S FOR FELLOW CITIZENS, YOU CAN TRUST TAMILS IN SL OF HIGHER POSITIONS WITHOUT ANY DOUBTS, COZ QUALITY BACKGROUND WITH WELL EDUCATED PERSONS NEVER BOW THEIR HEAD FOR OTHER THAN DUTY. GRT EX: KATHIRGAMAR, NEELAN THIRUCHCHELVAM. INTERGRITY S FIRST!!! If the rulers stick to the protocols like MS , there will be no ethnic issues , ordinary people are not racists , people who encourage racism are the politicians who wants to get advantage out of it .Sri Lankan people should identify and reject those people in future .